Another alum from “Queer Eye For The Straight Guy” has landed at QVC. Design expert Thom Filicia, a gay guy that one of our female friends lusted after, is doing a collection called “Designs for Living” for QVC, which debuts Wednesday. Filicia follows in the footsteps of Carson Kressley, who did a clothing line for QVC called Perfect. (BTW we literally bumped into him once on Park Avenue South). UPDATE: A reader, Sharon, kindly informed me that “Thom’s actually the THIRD. Kyan was on once with his hair product, “HerCut.” Sharon is referring to Kyan Douglas, who was our gay crush. As for Filicia, he has designed bedding, rugs and pillows for the No. 1 home shopping network. There’s more in QVC’s program guide. 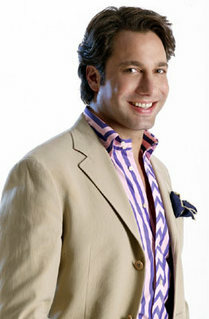 One of House Beautiful’s Top 100 American Designers, a House & Garden International Tastemaker and an EMMY award-winner, Thom Filicia is an accomplished home décor expert who you may recognize from popular shows such as Dress My Nest and Queer Eye for the Straight Guy. And now, he comes to QVC with his Designs for Living, where refined details mix with raw edges, industrial plays against organic, and where textures and palettes are used in unexpected yet classic combinations. Filicia’s fresh yet timeless approach to design can be seen as he infuses color trends and combinations with an updated design that is both beautiful and highly practical in his bedding ensembles and home textiles. You are currently browsing the archives for the Thom Filucia category.